This chili makes me so stinkin’ happy I can hardly stand it. It is soooooooo good. If I made it once a week every week for the rest of the winter I’d be one seriously happy camper. All of the credit goes to my sister, Leah, who’s tweaked this recipe over time to get it just right. The recipe, however, only lived in her brain…until now! All day Tuesday while I’m sure she was doing more important lawyering things, I sent her a flood of emails to get the deets: ingredients, quantities, instructions. The good stuff. Be sure to give yourself some time while cooking it. Maybe save it for a Sunday afternoon when there’s a holiday movie on TV. It takes a little while to brown the chicken and cook down the liquid so it slightly thickens, but it’s worth every single second–and then some. The longer your chili cooks the better it tastes. In addition to your usual suspects like tender chunks of chicken, white beans, corn, and heaps of spices I love that she sneaks swiss chard in here, too. I mean…what? Yeah, not the first chili ingredient you’d imagine. But trust me, you’ll love it. Or at least you’ll barely notice it. 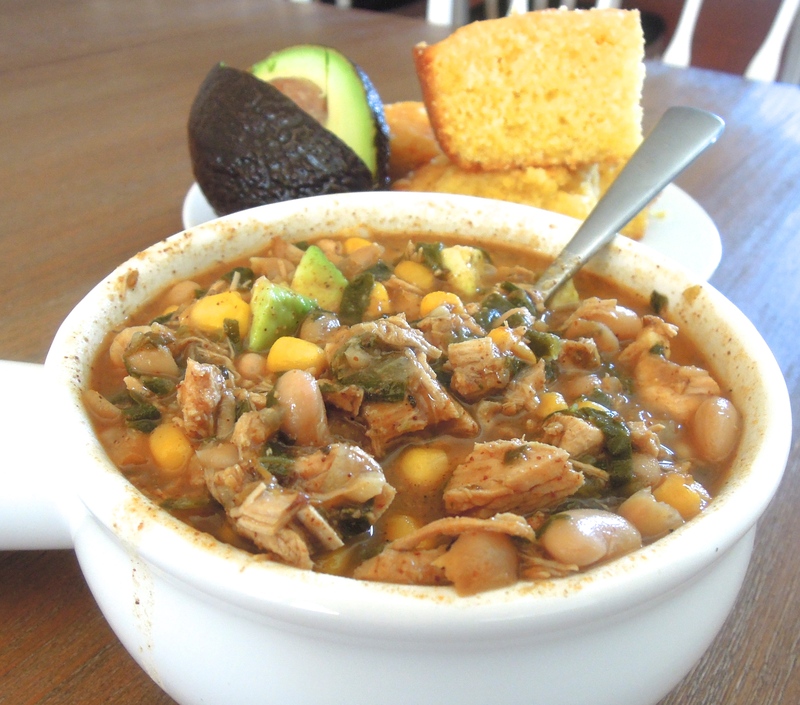 Serve your chili with some chopped avocado and cilantro and a delicious pile of buttery cornbread. Not only is it hearty and healthy, we loved eating leftovers for as long as they lasted. Season chicken breast with salt and pepper. Heat about 1 Tbsp olive oil in a big stock pot. In two separate batches, brown chicken breast two at a time, about 5-8 minutes per side. Chicken doesn’t have to fully cook through. Remove to a plate and set aside. To the pot, add onion and leek. Saute until onion softens, about 5 minutes. Add garlic and jalapeño, sauté about 30 seconds until fragrant. Add cumin, oregano, chili powder, and fennel seeds if using. Coat vegetables in spices and toast in pan, about 1-2 minutes, until slightly browned and fragrant. Pour wine or beer into pot and use a wooden spoon to deglaze bottom of the pan. Add chicken broth, white beans, and all four whole chicken breasts to the pot. Bring to a boil. Reduce heat, cover, and simmer about 60 minutes. Transfer chicken from the pot to a cutting board. Remove skin, pull chicken off the bone, and chop into bite-sized pieces. Discard the skin and bones, place chopped chicken meat back into the pot. Add the swiss chard, corn, and crushed chili pepper. Cook about 10 minutes more until corn is heated through. To serve, ladle chili into bowls. Top with any toppings of your choice such as avocado, cilantro, or cheese. *In order to avoid BPA, I limit cooking with canned foods as much as possible. I almost always use organic beans from Whole Foods that come in a cardboard box/TetraPak. Since I know they’re not as widely available I use the word “cans” in the ingredients to avoid confusion. 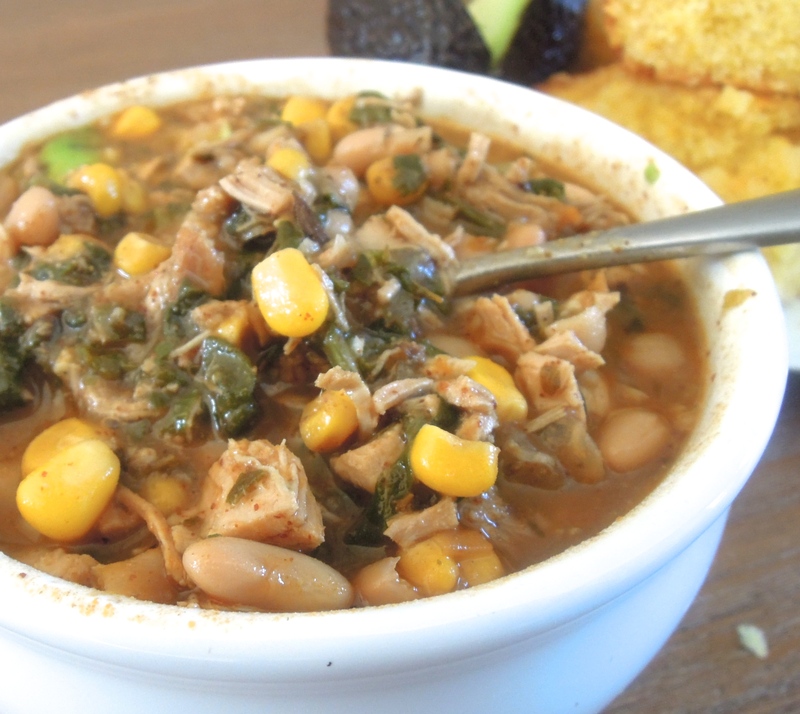 This entry was posted in Chicken, Poultry, Soup, Stew, Vegetables on November 21, 2013 by Paige Greenfield.